The use of Pilkington Planar™ in a glass mullion system enables the specifier to produce vertical glass curtain walls, canopies and skylights. 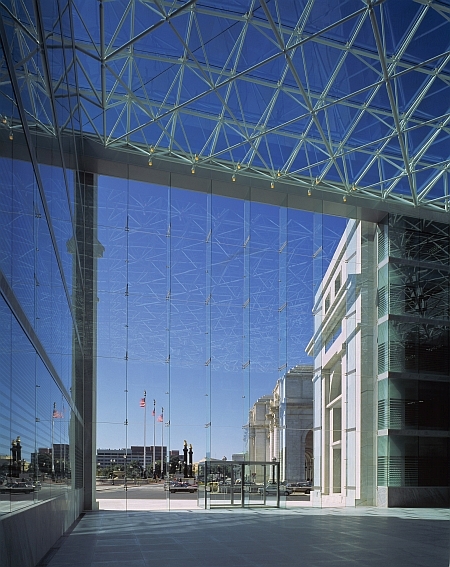 Glass mullions are used as support for maximum transparency and to transfer wind, snow and self-weight loading to the structure. Pilkington Architectural have led the way in the development and testing of this new technology having based it upon technology established in the 1960's for use with the Pilkington Suspended Assembly. Vertical structures of this type are usually suspended from the head structure above - with the glass panels fastened to the mullions by Pilkington Planar™ fittings. By supporting the facade in this manner it is possible to span distances as high as 24m and perhaps further still. Pilkington Architectural engineers are also able to protect against lateral torsional buckling of these glass mullions, drawing upon a wealth of experience and laboratory test results.